The Norovgood-2 inscription was found in 1956, during the excavations in Novgorod (Holmgard in sagas), in the layer (level) belonging to the first quarter of the XI century. The length of the fragment is 176 mm, width - 23-35 mm, thickness - 3-7 mm. In the right part of the fragment there are 32 symbols written in two and a half lines. Some of them might be Younger runes.The inscription was probably made in Boustrophedon. Letters in the half-line might be read from the right to the left. * The sign #2 might be the combined rune U+A or U+N. * The signs #8 and #22 probably are the same rune U, which often, especially in the earlier period of development of the Younger Futhark was cut as /\. * The symbol #7 is considered to be a L-rune. * The sign #11 is absolutely identical with the H-rune. * The symbol #21 might be a left turned K-rune. * The symbol #23 might be a left turned F-rune. * The signs #24 and #26 are probably the S-rune. * The sign #29 looks like the sign #11 (H-rune), but the stave doesn't go through the crossing point of branches. 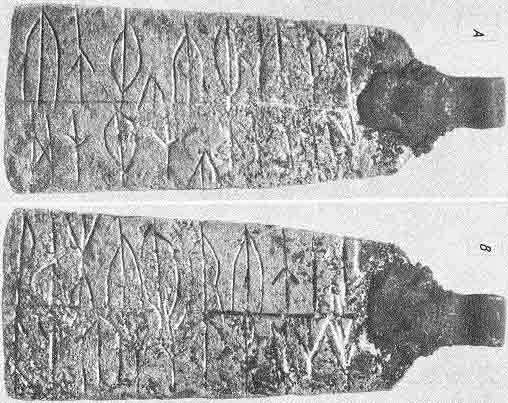 Therefore, some symbols of this inscription could be identified as Younger runes of the usual Danish variant, typical for XI century. The rest of signs cannot be identified as runes. It is impossible to interpret the subject of the inscription, as the origin of the rest of the symbols is still unknown. The circumstances of the discovery, the material, and the method of cutting, make this inscription very similar to the other find (Novgorod I) which was made in the same sector of excavations. 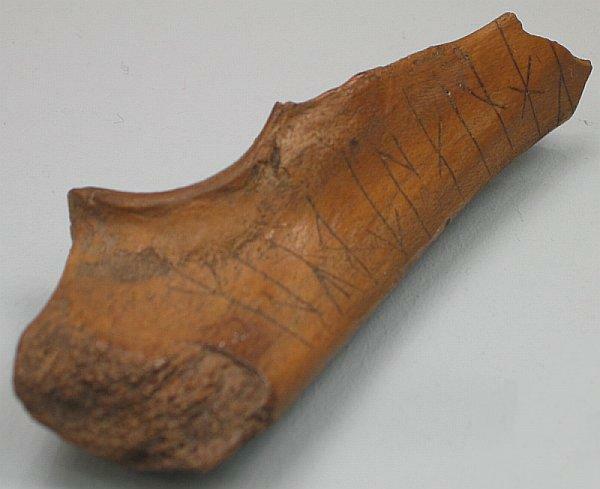 In 1958, a fragment of a left elbow bone of a hog (swine) with a runic inscription was found in the layer of the first part of XI century, during the excavation on the territory of an estate in the Nerevskij end of Novgorod. A sharp object had been used to scratch 11 runes which show the last part of the Younger Futhark. The first five symbols didn't survive. The drawing of the runes is similar to the famous Danish inscription from Gørlev. The main difference is the drawing of the M-rune. The Gørlev form is an earlier one, which was in use till 1000 A.D. 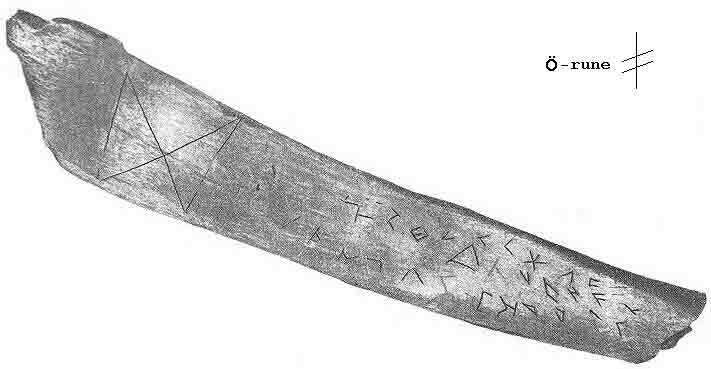 The Novgorod I inscription could not have been made earlier than 900 A.D.
Picture of the runic bone. In 1950, during the excavation in Old Ladoga town (Aldeigjuborg in sagas), a dressed round stick with runic inscription was found at a depth of 2m, in the level belonging to the first part of IX century. The length of stick is 42 cm, diameter - 1.5-2.6 cm, the length of the inscription is 12 cm. The text isn't divided into words and bears 48 signs; some of them (for example: 21, 25, 32) are apparently combined. The runes on the stick are so called "Rök runes", and is placed in Gosudarstvennyj Ermitaž (LS-1969). In poor English it migth be translatet approx. like this: "... (and) steered - down the hill to the fertile dike - across the brave men's hamlet in an enormous body of ploughs." In the picture underneath you'll find three other variants of the interpretation of the text. First of them belongs to two Russian scientists, V.G.Admoni and T.I.Silman (I). The second is of G.Høst (II)(see her book "To runestudier. - NTS, 1960, b.19, s.418-554). The third is of V. Kiil (III) (Runepinnen fra Gamla Ladoga. - ANF, 1964, b.79, s.31-42). All of authors gave different spellings of the inscription. The authors describe the text as a magic spell expressed by typical form of Eddic verse with alliteration. "Atop [of the shield - G.Høst] dressed in his feathering [feathering of eagle - G.Høst], covered with hoarfrost, lord; glistening moon-wolf; broad way of the plough"
G.Høst considered that this verse contained three poetical images: of Hrelsvaeg jotun (see Gylfaginning and Vafthrúdnismál, 37), of Skati moon-wolf, and of Gefjon's ploughing - three pictures painted on the shield. Translation: "Died (=gone after his death) in up high, dressed in (grave)stone, owner of corpses (=warrior), glistening, blighter of men, in the powerful road of plough (=in ground)". Translation: "Arrow tail dressed in feathering, glistening pike appeals trophy (kill) in great amount". V.Kiil considered this inscription to be a magic spell and compared it to the Eggja inscription. Picture of the runic stick. On 27 Aug 1975, during the excavation near Varangian street in the Northern part of Old Ladoga town, a thin copper plate with an eyelet was found in the layer of the 2nd part of 10th century. The height of the find is 48 mm, thikness is 1 mm, width of the top part - 14.2mm, below - 18mm. The original eyelet was broken already in antiquity, and a bronze one was fitted to the pendant. Both sides of the find are filled with scratched runes. There are 23(? )-24 signs on each side written in two lines which are divided with a vertical line. Some runes were damaged while repairing the pendant. The length of lines is not more than 35 mm and the height of runes is from 3-4 till 10 mm. The majority of the symbols were not typical. (E. Moltke and A. Liestøl, having explored the item, also mentioned the specific character of its runes). The second feature of the inscription is that there are many repeated signs. The picture shows the runic stone from Berezanji Isle in the estuary of the Dnepr river. 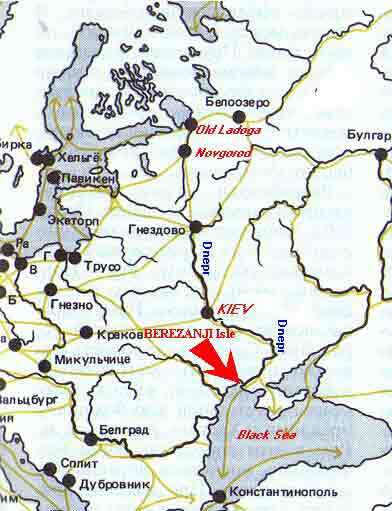 This territory belonged to the Russian Empire, then to the USSR while it existed, now it belongs to Ukraine. 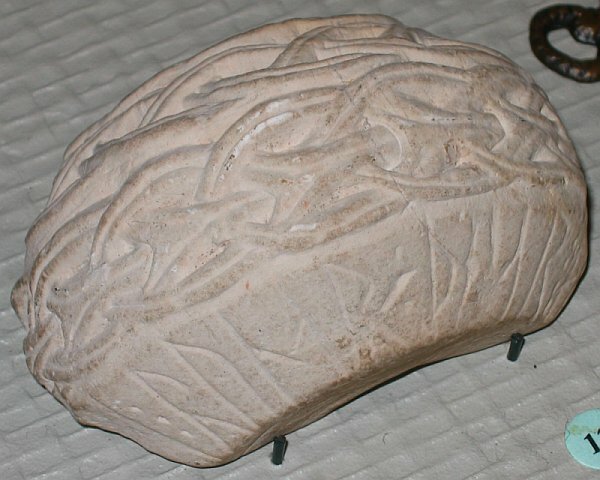 This stone now is in the Odessa archaeological museum (registration number 50378). The stone was found in 1905 in a grave-mound, by E. P. Shtern, the professor of Novorossiysk University, during the excavation on this isle. The stone lay in the tomb under the head and bust with runic inscription turned down. Apparently it originally stood on one of the nearby grave-mounds before it was was laid into the later grave, but not for very long for it wasn't much damaged by wind erosion. The stone with the inscription is a fragment of the memorial, the second part of which wasn't found. Height is 0.47 m, width - 0.48 m, thickness - 0.12 m.
On the surviving fragment a crucifix isn't present. The inscription can be dated from XI century. 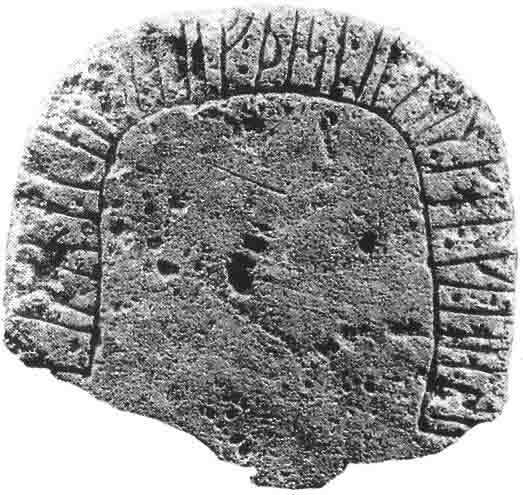 The Russian runologist F. A. Braun guessed that Grani and Karl were Gotlanders, since the Old Norse word "hválf" - grave-vault ("half" in the inscription) was much more common on the Gotland island than in the others part of Scandinavia, and the text on the Berezanji stone is typical for Gotland stones. The translation is: "Grani made this grave-mound after Karl, his comrade." ¤ En svensk runinskrift i Sydryssland, Fornvännen 1907, side 204. Projektet Samnordisk runtextdatabas, 2014. Forvännen 1914 side 44 - 48. During the excavation in 1937 in the Daugmale burg in Latvia, a head of a mace or a club made from flag-stone was found. The layer where the found was made dated from IX century and contained numerous Scandinavian items: oval brooches etc. The height of the mace-top is 4.6 cm, diameter is about 8 cm. It is ornamented with interlacing bands, which is characteristic of Gotland Island. The inscription is located on the bottom part of the mace-head. The width of the inscription is around 1 cm. All surviving symbols can be read without difficulty. The translation is: "... these runes..."
Spekke A. "Latvijas vésture". Stockholm, 1948, Taf. 5. Spekke A. "History of Latvia. An outline". Stockholm, 1957, taf. X: 1. Lindquist I. "Die Inschrift mit Runen aus dem Burgberg zu Daugmale, Lettland". Celi XIV. Lund, 1969, s.33-34. A treasure trove was found in 1973 in the IX century cultural layer of a settlement near the village Bolshoe Timerevo (Big Timerevo), under Yaroslavl town. A necropolis of the same period located near the place of the find contained some Scandinavian graves. Among the coins there were four bearing runic graffiti. Now the coins from that treasure are in the collection of the Hermitage. 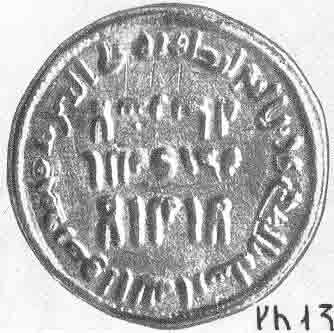 The diameter of the coin, an Arabic dirhem, is 25 mm, weight is 1.02 gram. The inscription on the coin says: guð, which is translated "God". There is runic graffiti on another coin from the Hermitage collection, St. Petersburg. The location where this Arabic dinar was found is unknown. The diameter of the coin is 19 mm, weight 4.23 gram, and the date of mintage is 701 / 702 year A.D. The fourth symbol could be interpreted as the "r" rune without the vertical line. (There are examples of such drawn on the Sparlösa stone, Sweden and in the Old Ladoga I inscription.) Alternately, it could be the "s" rune. If the last rune is "r", which is more likely, the inscription should be interpreted as gótr or gautr. That could be translated as "man, warrior". In runic inscriptions, kutr or kautr was usually the second part of personal name (for example: Asgótr, Asgautr, Wigótr, Wigautr), although the name Gautr was found in some Swedish runic inscriptions (for example, "kaus" - Upplands runinskrifter, 617). The second possible interpretation is that the word Gautr is the well known by-name of Oðinn. If the last rune is "r", then the word is in the nominative case. If the fourth rune is "s" (kuts), then the word has the genitive case, i.e. "Gautr's, belonging to Gautr (Oðinn). In that case this coin was probably from a hoard sacrificed to Oðinn. Another translation based on Linder Welin's report (in his article "Graffiti on Oriental coins in Swedish Viking age hoards") that if the second rune in the inscription is the long "ó" and the last one is "s", then it is possible to read the graffiti as góts (Old Norse - "góz", Old Swedish - "gods, gots, gozt") - "property, tenure". The text is written from the right to the left with left turned runes. The runic text might be an old Gothic man's name, which is more likely the name of owner, than the smith's name who made the spearhead. But it might also be the the name of the spear. The name can be translated "that who hit the goal" or something like that. Under konsstuksjon!!! 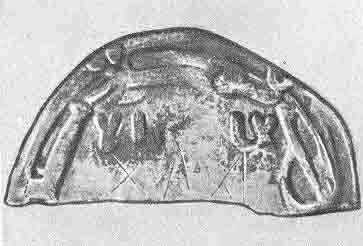 The inscription on the Kowel spearhead is the oldest runic inscription. It was ploughed on spring of 1858, the south-west of the Sushichno village, 30 km from Kowel town. It was Jan Sziszkowski who dug out it. Kowel spearhead was made from iron. The length is 15.5 cm, max width is 3.0 cm. Both sides A and B were inlaid with silver symbols. The inlaid was already damaged heavily, when the spearhead was found. The spearhead can be most likely dated from the first half of the 3rd century. The majority of runologists consider the spearhead to be East-German, or most likely - Gothic. There is no the unambiguous translation of the inscription, but almost all scientists divide the word into two parts: 1st - "TIL" - is bound with the word "target", the 2nd is considered to be the present participle of the verb "ride" (Old Norse - ríða, Old Norwegian - rîtan, Old English - ridan. The whole word "tilarids" is translated as "going to the target" (J.Werner, W.Krause), "brave, bold rider" (J.Brøndsted, J.Kostrzewski), but often as "attacker" (H.Arntz, H.Reinerth, E.A.Makaev) or "overrider" (W.Krause). And now the last portion of information about Kowel spearhead: The spearhead was exhibited at various times, many photographs were taken. In 1880 its sharp casting was made by The Berlin museum of Prehistory and Early history (Staatliches Museum für Vor- und Frühgeschichte zu Berlin). Another one was made in 1884 in Warsaw. After its owner A.Szumowski's death the spearhead was lost, but appeared again in Warsaw in 1939. The World War Two began and the spearhead got to Berlin into The German Archeological Institute, were in 1940/41 W.Krause made a collection of its photographs. In the end of the WW-II the spearhead was taken away to Upper Franconia where was lost again.